Mages of Mystralia, being one of the games that I was looking forward to playing at PAX, was thankfully not a disappointment. It was actually a lot more impressive than the videos give it credit. In Mages of Mystralia (M.o.M. from here on out) you play as Zia, who I’m told, discovered that she knew magic when she burned down her own house. Needless to say that she was kicked out of her village because magic was banned there. I guess arson is fine though. What gripped me was the magic crafting system. While good stealth is something I love over almost everything else, an amazing crafting system is also on the top of my list. In M.o.M you craft the spells. At first, if you cast a fireball it will literally sit there. You have to place a movement glyph on your spell crafting table/book/thing. From there the world is your oyster. 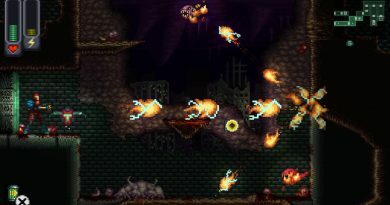 Do you want to cast multiple fireballs and then have them explode and then have the explosion cast a lighting spell that also explodes and splits? Well, you can! It’s all a matter of mana and so you can create an amazing spell, but like in my case, I was only able to cast it twice and then I had to kite the baddies. This is another 3D platformer that gives an almost nostalgic feel, but it’s more stylized than those games going for a purely nostalgic value. It more reminds me of the art style of Tunic or Albion Online and I really enjoy the cel-shaded graphics when done so smoothly. Unlike the demo I played, you’ll have to adventure around in the game to find all of the runes you’ll use in your crafting. There are also puzzles that will need to be solved by crafting a specific type of spell. The one example that was posed to me was at one point you may need to cast a fireball over a wall of sorts and on impact have it break into three and then light three individual torches. This was kicked up a notch in the new Archmage mode where new enemy types, not found in the regular mode, were added, bosses will be tougher as will some of the puzzles found around the world. I am very excited about Mages of Mystralia. and can’t wait to play it more!